The Salahutu mountains are the highest peaks of Ambon island, with two over 1000 metres high. Although that does not sound particularly high, the hike is rather challenging for a mountain of such a size and the highest peak is rarely visited. Lots of local students climb Salahutu from Waai village (famous for its belut – sacred eels) but unfortunately they only ascend to the second highest peak which just creeps over the thousand mark. It is, however, a very worthwhile hike in itself with extensive views over the east coast of Ambon island and some minor peaks of western Seram in the distance. It takes about 5 hours to reach the summit from Waai village on the Leihitu peninsula and the trail starts just a few metres above sea level. From the brow of a very minor hill on the main road near Waai a small plantation trail leads up into the mountains. Finding it could be tricky without a guide as there is no sign and you could easily drive past it. Follow the trail as it weaves through plantations. At an approximate elevation of 140m there is a junction where you take a right turn which drops down to a small stream and then up to the remains of a building called Rumah Cengkeh (‘Clove House’, 214m). The trail then begins to climb up onto a narrow spur with steep drops either side. This is already a fine viewpoint although if you want to avoid the worst of the heat it is probably a good idea to climb at night. Indeed, progress is very slow and even when you eventually reach the grand elevation of 450m, you find that the trail descends steeply down to the left to the Waai Tasoi river (314m). This is a good place to have a rest before crossing the river and ascending once again. There are some beautiful and large butterflies in this area, both during the day and at night. After heavy rain the river may be difficult to cross, but even during the dry season you may very well have to take off your shoes and socks and wade across so be prepared! The trail now ascends steeply and is muddy and covered is thick roots which can make things a bit difficult. However, once above 500 metres elevation the temperature gets a little lower and you start to sweat less! The sound of the river still reverberates long after leaving it and when you reach a sign at 689m the trail is very close to another smaller river. This is the final source of water on the hike. From this point the trail gets muddier but the view really opens out and eventually you will reach the place that most local people consider the ‘top’ of Salahutu. It is crowned with a broken cement trig pillar and the remains of a few small camp fires. The view eastwards is not limited by trees or other vegetation and as a result you can see the eastern coastline of Ambon island, nearby Haruku island and some of the lesser peaks on the large island of Seram. 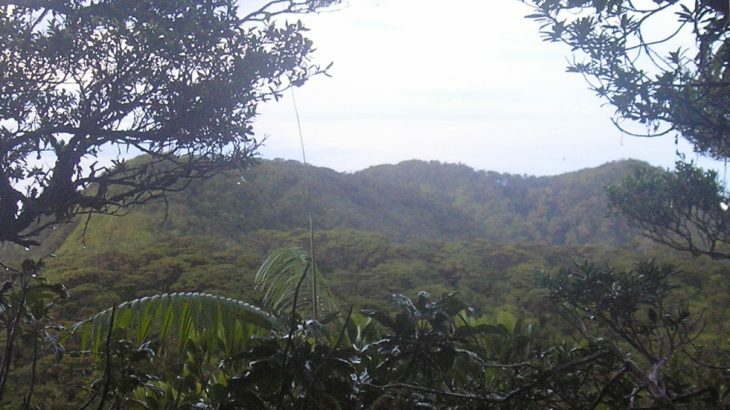 The view west is largely obscured by trees but if you look carefully you will be able to see the true high point of Ambon island, lying about 2 kilometres further west, beyond a lesser middle summit inbetween. Frustratingly, that 2 kilometres involves a lot of ascending and descending and there is no clear path. Very few locals seem to climb to the real peak, at least from this side, and in total it would probably require a 2-day expedition hike to the true peak and back. That is, assuming there isn’t a trail to it from another direction. 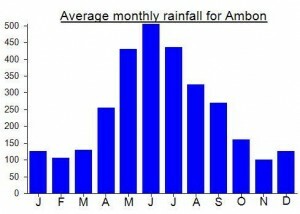 If you have any information on the true Ambon island peak please leave a comment below! The descent takes about 3 and a half hours. Local hikers like to bathe in the Waai Tosoi river on the way down – a good way to cool off before the final 90 minutes through plantation back to the main road. The true summit will probably have a different name but I was unable to get a definitive answer during my time there. If you stay in Ambon city, it is worth taking an ojek (motorcycle taxi) up into the hills behind the city to Soya Atas (5km away) and make the short 10 minute climb to Gunung Sirimau (464m). It is a historically important areas and is full of sacred stones and the like. There are some nice views over the city and to the highest peak in the distance. Getting there: Plenty of flights to Ambon from across Indonesia. From Ambon city, take a taxi or ojek for the 25km to Waai village – this should take no more than one hour. Accommodation: There are many hotels in Ambon itself. The Victoria Guesthouse, near the Peace Gong, is central, clean and cheap. Permits: Not required but take a photocopy of your passport photo page just incase. Water sources: Thankfully there are several. A stream at 119m, the Waai Tasio river at 314m and the river below the sign at 689m. Just back from my failed attempt on this one… an unexpectedly tough one. Nobody I met seems to know much about the true peak, only the second highest peak that is a popular climb for locals. Great dawn views but utterly knackering. I climbed at night and in rain (which cleared by morning) but I have never climbed so slowly due to the humidity and temperature. A pretty mental trip to do on a regular weekend but better than sitting around Jakarta with the usual oceanic quantities of Bir Bintang for company. I hope to find out about the true peak before long.